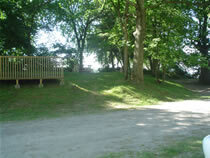 Our RV and Camping areas are waterfront or within a 100 yards of the St. Lawrence River in the heart of the 1000 Islands. Rates include electricity with 20 amp service, this service does not support the use of air conditioners, regulated drinking water and complimentary washroom/shower facilities. For outdoor cooking, there are fire pits and picnic tables at each site. You can bring your own boat or rent one. An on site boat ramp is available with docking & parking facilities. For information about bike rentals, sea kayak rentals and tours, and area activities click on the appropriate link on the left navigator. 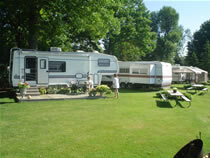 For photos of the resort and camp sites see the Photo Gallery.